Henning Juul is an investigative crime reporter in Oslo, just returning to work after a two-year hiatus. He needed that time to recover and mourn after a fire in his flat killed his six-year-old son and badly burned Henning himself. 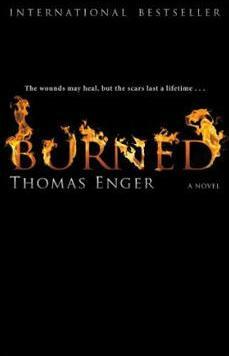 His scars are external as well as internal: Henning is overwhelmed by guilt at having failed to save his son Jonas, and his wife Nora divorced him while he was in the hospital recuperating. With this backdrop, Henning returns to work reluctantly, and is immediately confronted by a horrific crime: a beautiful, talented, popular college student has been half-buried, stoned to death, flogged, and partially dismembered. Yes, you read that right. On the cop shows they call that “overkill.” And finally, Henning is assigned to work this case with his ex-wife’s new boyfriend. As it turns out, the new boyfriend storyline doesn’t really go anywhere; the plot revolves around Henning’s investigation of the murder case. He does experience some angst over his ex-wife; more so over his son; but primarily we stick to the murder-mystery thread. The case at hand imitates a movie script the dead girl wrote, which is an interesting plot device; there is some question as to whether this is a Muslim honor-killing under somebody’s interpretation of sharia law, or whether the cops’ arrest of the victim’s Muslim boyfriend indicates racism and/or a jumping to too-easy conclusions. As you are beginning to understand, there’s a lot going on here. That may be one of the downfalls of Burned, though. This plot undertakes many interesting inquiries, and resolves few if any to satisfaction. We get a good picture of Henning’s inner workings, at least; as a series character he shows promise. The tragedy of his own disfigurement, the loss of his son (to death) and his wife (to divorce), and his psychological trauma definitely lend themselves to another book or several. But the many plot threads picked up in this book are mostly put back down again after cursory treatment, which left me feeling a little bit jarred and jumbled. There were several small details that were left unexplained. There were loose ends. Henning sighs. Perhaps it’s right that Jonas is here now, he thinks. My lovely, lovely boy. He remembers the leap through the flames, how he tried to shield his face with his hands and arms, his hair which caught fire, the burning and the stinging, Jonas’s eyes when he saw him, how he helped extinguish the flames, before they got to them. Really. I tell you. Even if it were the only example – which it wasn’t – a sentence like this will help to ruin a reading experience for me. It wasn’t all bad, really. Henning is an engaging character and I cared what happened to him. I wanted the solution to the puzzle, which motivated me to keep reading. That solution disappointed me, frankly, but I still care about Henning. The ending clearly leaves the door open for more of him, and I confess I’m tempted. But with this many loose ends, I’m not sure I’ll subject myself to the frustration again (particularly when compounded with such stylistic offenses as the pronoun mess above). Not a complete failure, but far from a raging success, I’m sorry to say. Many thanks to the publisher for the copy they sent me, all the same! That is a horrible passage. Ugh, I feel so badly being unpleasant, but ISN’T it? ?